Another batch of six ambassadors have presented their letters of credence to President George Manneh Weah with impressive exchange of friendly pleasantries, a day after Mr. Weah received letters of credence from six other ambassadors from three continents. The Executive Mansion says in a press release that presentation of letters of credence by the six ambassadors on Friday, 25 January brings to 12 the number of diplomats announcing their arrival and assignment in the country within a week. The latest ambassadors from Australia, Thailand, Guinea Bissau, Italy, Botswana and Vietnam have promised to strengthen and expand diplomatic ties with Liberia. The President says he is convinced that the presence of these countries in Liberia would yield substantial mutual benefits for Liberia and their respective countries.Of the six ambassadors, Australia’s Andrew Barnes was the first to present letter of credence on Friday. Welcoming Mr. Barnes, President Weah said he was glad to have the Australian envoy in Liberia, adding that he looked forward to building a more cordial and beneficial relationship with Australia. “I hope your coming will help strengthen our relationship,” President Weah emphasizes. “Liberia and Australia’s ties have come a long way and it is my hope we will work together for the benefit of our both nations,” he concludes. For his part, the Australian Diplomat says it is an honor representing his country in Liberia which he says has enormous potential to flourish economically.“Our relationship with Liberia has been strong and excellent,” Amb. Barnes notes. 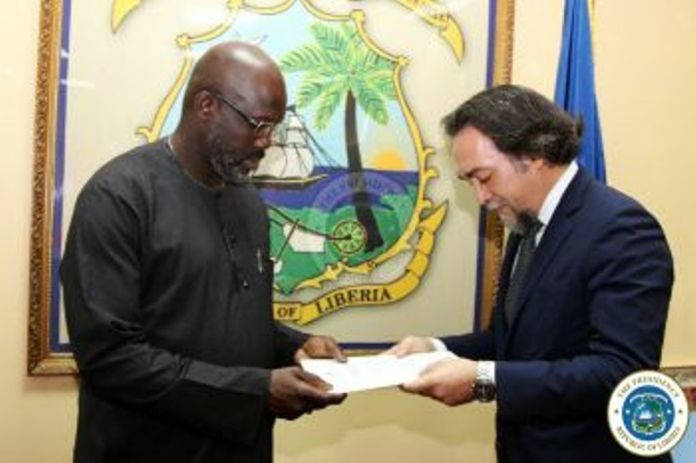 The Australian envoy discloses plans by Australian firms to invest in the country, particularly in the area of mining.Also presenting his letter of credence, Ambassador Aroon Jivasakapimas of Thailand recounted fond memories of Liberia as a country of good hospitality.He assures that his country’s ties with Liberia will boost bilateral cooperation. In the same vein, Guinea Bissau Envoy, Ernesto Muntaga Jalo praises the diplomatic ties between Liberia and Guinea Bissau, noting that President Weah was truly an inspiration to the African Continent who did not need introduction. Mr. Jalo says President Weah made enormous contributions to the Continent that cannot be ignored, expressing confidence that President Weah’s leadership will help move Liberia forward. For his part, Italy’s Stefano Lo Savio says Liberia and Italy’s relations have come a long way and in the best interest of the peoples of both countries.He discloses that the Italian government is interested in investing in Liberia’s oil and gas sector. Also presenting his letters of credence, Ambassador Pule Batimanki Mphothwe of Botswana, says Liberia and Botswana share things in common and expresses hope that the ties between the two countries would garner enormous strength.